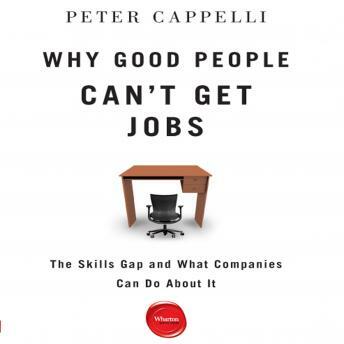 Peter Cappelli confronts the myth of the skills gap and provides an actionable path forward to put people back to work. Even in a time of perilously high unemployment, companies contend that they cannot find the employees they need. Pointing to a skills gap, employers argue applicants are simply not qualified; schools aren't preparing students for jobs; the government isn't letting in enough high-skill immigrants; and even when the match is right, prospective employees won't accept jobs at the wages offered. In this powerful audiobook, Peter Cappelli, Wharton management professor and director of Wharton's Center for Human Resources, debunks the arguments and exposes the real reasons good people can't get hired. Drawing on jobs data, anecdotes from all sides of the employer-employee divide, and interviews with jobs professionals, he explores the paradoxical forces bearing down on the American workplace and lays out solutions that can help us break through what has become a crippling employer-employee stand-off. Among the questions he confronts: Is there really a skills gap? To what extent is the hiring process being held hostage by automated software that can crunch thousands of applications an hour? What kind of training could best bridge the gap between employer expectations and applicant realities, and who should foot the bill for it? Are schools really at fault? Named one of HR Magazine's Top 20 Most Influential Thinkers of 2011, Cappelli not only changes the way we think about hiring but points the way forward to rev America's job engine again. Gildan Media is proud to bring you another Wharton Digital Press Audiobook. These notable audiobooks contain the essential tools that can be applied to every facet of your career.